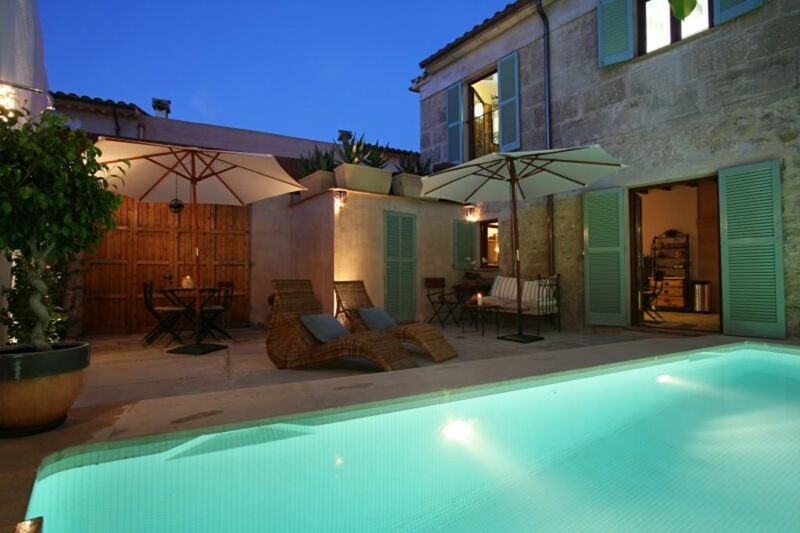 Situated in the historic quarter of the Old Town of Pollensa, the house is a few minutes walk from the fabulous main square with all its pavement cafe bars, restaurants & shops on your door step. The house has been lovingly reformed using the best quality materials, all the fixtures and fittings are of a high standard. The house enjoys a private good sized terrace with dining table, sunbeds and separate sitting area and a lovely very private swimming pool. The house can sleep 6, on the first floor there is one large master suite with super king size bed and en suite bathroom with a luxury stone bath with shower overhead, two further smaller bedrooms one with a king size double sleigh style bed and single bedroom with comfortable single bed. Also on the first floor is a second modern bathroom with wc, basin and large walk in shower. Downstairs there is a further single bedroom which can also be used as an office or study and a third bathroom with w.c. sink basin and large walk in shower. It benefits from hot & cold climate control Daikin air conditioning. The upstairs bedrooms and lounge also have radiators and there is a very efficient wood burning stove type fire in the lounge for the winter. The kitchen dining room has a table with seating for up to 6 people, stainless steel range cooker, dish washer & retro style fridge and microwave. The house dates back to 1850 and is one of a very few detached properties in the historic old town. The house has a lovely mix of the old character features blended beautifully with modern facilities and appliances striking a wonderful balance between old and new. The court yard area is completely private and not over looked from any aspect. The sun is on the terrace from approximately from 10.00am to 5.00pm during the summer months, slightly less when it is lower during the winter.The road is very narrow at the front of the house and only a handful of cars come along it each day making it very safe for young children, it is possible to park directly in front of the house for unloading although you can not park there for extended periods as it is too narrow for another car to pass by, this does not cause any problems as there are not many cars that need to do so. The house has UK Satellite TV with a free to air digital Sat box, high speed broadband WiFi and a music centre with radio, cd player and a iPod connection. Outside there are bluetooth external speakers to connect your phone or iPod / iPad to. The swimming pool is 18´ x 8´ (5.7m x 2.4m) and has a heating system to heat the water temperature to approx 25 °C year round. The house has been for rental with Vida Villas since 2008, the current owner purchased the house is 2012 and they take holidays a few times a year. They live in Swede and enjoy the chilled vibe of the house and Pollensa Old town. Lovely sunny terrace with a heated pool means the house can be used all year round. The en-suite bathroom off the master bedroom has a luxury stone built feature bath with large shower head over it. The two other bathrooms have large walk in showers with stone floors and large shower heads. The heated pool is 18' x 8' and is 1m deep at the shallow end and 1.5 m deep at the deep end. The outside terrace is large enough to store bicycles with separate easy access to street. Plenty of space for a family of 5. Very nice bathrooms/showers and lovely Master bedroom with huge comfortable bed. The single beds were unfortunately not so good. Ok for young children but not adults or my teenagers! Yes parking is very tricky near the villa, but there were always spaces on the edge of town. Overall, a great holiday over Easter for an active family. We really enjoyed exploring Northern Majorca. Would definitely return to Pollensa. Well equipped, great location, minor queries dealt with quickly. Perfect! We were 3 adults and 1 child of 11 years so had plenty of space. The interior design was in keeping with the island. Comfortable beds with lovely linen and bed spreads. The pool area is not massive but provides a comfortable area to relax in and the pool was perfect for a refreshing dip but not to do laps! Easy walking distance to the centre for shops and restaurants. A mini local grocery store for light lunches at the villa. Can recommend the San Jordi Hotel for dinner, just a 2 minute walk from the villa. All in all a fabulous holiday and we would return! Having stayed in Pollensa many times, we visited Abulqassim for two weeks in June and enjoyed our stay so much we came back for another week in October. Abulqassim is spacious internally with a great dining kitchen although the real selling point is the secluded outdoor area and pool. The pool is large and heated meaning it can always be used and unlike a lot of other townhouse properties there is plenty of space around the pool to relax in. Combine these features with the proximity of the property to the main square and Abulqassim is our first choice property in Pollensa. This was our second visit to this charming house. The house has everything required and all appliances are top quality. The house has been kept in immaculate condition and is always spotlessly clean. It is a perfect size for a large family. We are a family of six, two of which are children. The master bedroom is enormous and very comfortable. The three other bedrooms are a decent size and perfectly adequate. The three bathrooms in the house are a real bonus. Nothing is too much trouble for the owner Colin who is always available and happy to help. The location is just about perfect close to the beautiful Plaza Mayor and Calvari Steps. The beautiful beach in Port de Pollenca is only a short bus ride away. There are plenty of shops close to the house - an excellent bakers and butcher. There is a large supermarket a five minute or so walk away. There are plenty of restaurants around the Plaza Mayor. We used Il Garginio many times and were never disappointed although it is a little on the expensive side. GR221 is also very good. Thank you for your glowing review, you are very welcome any time it is nice to have repeat guests that enjoy their holiday each year. Looking forward to seeing you all again next year. The northernmost spurs of Sierra de Tramuntana are the backdrop of the Mallorcan town of Pollença. The town has a medieval historic quarter that sits only a few kilometres away from the Mediterranean sea. The town, under the shade of the mountains of Puig de Pollença and Calvari, has managed to preserve intact its personality, despite being only a short distance from the bustle of the beach. Pollensa has been a preferred destination of painters and artists since the beginning of this century. Here, the cultural and artistic life never stops. The main square with its pavement cafes and chique restaurants is the hub of the towns unique charm. There are a lot of art galleries and museums. During nearly all the year one can enjoy a variety of musical events and fiestas among which the most famous ones are those which take place in the Santo Domingo Cloister. The town is open all year round with walkers, cyclists and bird watchers taking over from the summer tourists in the cooler months. Golf: Pollensa Beautiful 9 hole course 3 km away, Alcanada closest to links golf 12 km, approximately 20 others including championship quality within 45 min drive. Rates are in GBP Sterling, change over day is Saturday. 30% deposit is required when booking with the balance becoming due 8 weeks prior to arrival. Payments can be made by bank transfer or by credit card 2.5% surcharge applies. A security/breakages deposit of £250.00 is also required prior to arrival. All charges include, electricity, pool heating, air conditioning and winter heating.